I was one of the OPs with the fixes for the hot-start, but since my mechanic did 3 things at once it was tough to tell what fixed it. Glad you folks have continued the research and found that the electrical connection is the place to start! That's by far the easiest/simplest solution. Shortly before selling my '99 Esprit V8 I had multiple head gasket failures on a freshly rebuilt engine. Everything came from JAE (every time), so it makes sense that I had the same issue. I didn't talk to them about it since I had no reason to assume the gaskets themselves were bad. Ah, if only I had known! 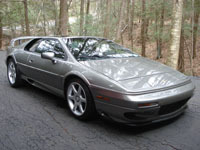 Hi all, I'm looking for the following: Lotus Esprit V8 twin turbo 2003 or 2004 FE "Final Edition". Exterior Color: Dark grey (Gunmetal or Titanium Metallic) or Blue (Azure Blue - if any exist as Final Editions). Interior color: Grey (Charcoal) or Black. Low miles (<15,000 ideal) Proper service records Excellent to "like new" condition No major problems, failures, collisions, stories, or drama. ￼ Owner must be willing to have car inspected by a Lotus mechanic. I'm in Connecticut, but will travel anywhere in the continental USA for the right car. (Sorry Hawaii and Alaska) Please reply here, PM me, or email this address without the dashes: [email protected] Thanks! The JAE website is Flash based, so you have to access it on a regular computer (not an iPhone/iPad), or use a browser like "Photon" for iOS that allows you to see Flash content. Good news! Mechanic reports that the valve tap went away this morning (the oil must have worked its way in there), and then he drained the conventional oil to refill it with the "normal" Mobil 1 synthetic 15W-50. Pressure went up to steady 23psi at hot idle, and the warning light has not come on at all (since pressure is above 20psi). Whew! Now he's got to go back to something different to complete the break-in (conventional again), but at least we can breathe a little easier knowing there is nothing mechanically wrong with it. Thanks for the info, everyone! Thanks, everyone for the info! The new oil is going in today and we'll see how it goes. Hi Bibs, That's a good question, though I don't know the answer. I know he used conventional oil on this first fill for the break-in, but I don't know the weight. It's about 32 degrees F here. I would be very glad if it's just a matter of putting a different oil in! He mentioned trying a different oil first (and checking the pressure with an analog gauge), so I guess we'll see how it goes this week. Do you know what the current oil recommendation is? Last I had seen, there was a TSB around 2000 for: Cold: 0-15W Hot: 40-60 Specifically Mobil 1 Motorsport 15W/50 and Castrol Formula RS 10W/60 (but neither of these are around anymore). Thanks, - yes this is 20.3 psi, so the current pressure seems low once it warms up. Any thoughts on what could be the cause? Hey everyone, It's been a while, but my 99 V8 is finally nearing the end of a long rebuild that was due to sandblasting/powdercoating damage (new block, oil pump, oil coolers, oil lines, bearings, etc.). We started it up yesterday (first time in about a year and half), and it ran smoothly overall, but 1-2 valves were tapping (new tappets), and the oil pressure light was flickering at idle (once it had warmed up a bit). Pre-rebuild that light never came on. We had installed an aftermarket oil pressure gauge a while back, and it was reading about 20psi most of the time, and down to 15psi once hot (taken from an oil filter adapter ring). At this point the oil pressure tell light in the dash was coming on, which makes sense since I believe it is supposed to come on under 20psi. The owner's manual says minimum oil pressure should be 1.4 bar at hot idle (which is 20.3 psi), but the mechanic reported that the minimum oil pressure in the service manual is like 5psi. Is that correct for the V8s or just the 4 cylinder models? The general rule of thumb I often hear is to have 10 psi per 1000 RPMs, which would also mean 15 psi is fine (at about 800 RPMs), but I'd like to know what other V8 owners are really getting. Is 15-20psi oil pressure ok at hot idle or should I be concerned? Thanks for any info! Post-rebuild bearing care: proper way to prime? Is idling bad? Hi Derek and Gunter, Thanks for the info. Yes - good thought. It's odd that the service manual says "the engine should be cranked with the ignition disabled until oil pressure is registered on the gauge", because you are right that fuel will be injected and then left unburnt! Yes, I believe this is the setup he had when the engine was in the video - there was a short bypass oil tube instead of the long run to the oil coolers. Well that video was from the second rebuild and I am not sure. I know at least for the current build (#3) that all of the measurements and tolerances are supposed to be checked and rechecked by the machine shop, even with the bearings in place for good measure. But wouldn't the speed of that test setup depend too on whatever power source is driving it? I have no idea if that was compressed air or a electric motor of some kind - maybe the speed is variable. So you think that test setup in general is an ok thing to do - i.e. there is enough oil pressure at that very low speed to keep the new bearings properly lubricated? So my 1999 V8 is just about at the end of its 3rd rebuild in about a year's time (see other threads for details), and I'm trying to learn as much as I can about the best post-rebuild process so that I can talk to my mechanic somewhat knowledgeably. I am really hoping that I never have to hear the sound of rattling bearings again! Once you have rebuilt an engine, putting assembly lube in all the bearings, what is the right way to "prime" the engine to get the oil everywhere before actually starting it? The Lotus manual suggests removing the spark for a few cranks until pressure is up, and then you are good. But do you have to use some kind of hand pump to get the oil in everywhere first? I am also wondering if proper oil pressure can exist at very low RPMs, like what is shown here from my second rebuild: They were flushing the oil, testing for leaks, and making sure everything was good, but I wonder if doing this might have caused more bearing wear if there was not enough oil pressure. I don't know how they were making the engine turn. Is this a normal (good) thing to do? Finally, once the engine is in the car and running, is it bad to let it idle in the shop for a long period? They had done this for many hours to again make sure there were no leaks and everything was working well, but I remember hearing that you should avoid extended periods of idling after a rebuild. Does that mean you should start driving it right away? Thanks for any thoughts. Just an update... heads and cams are done. Didn't have to add any material - the machine shop just machined down the cam caps a bit to smooth them out (taking material from the bottom surfaces and then reboring I imagine). I guess there wasn't that much material gone from the heads after all. Now onto the block and main caps again. Turns out the sound was from one of the main bearings being spun (the one with the thrust washers). So this makes 2 different rod bearings and one main bearing failing. A few thrust washers too. But they are all in the same general area, so I'm really thinking there has got to be a lubrication issue somewhere (like a blocked passage). So the lower end is finally getting align honed and the block cleaned again. I'm insisting this time that all of the oil passages get thoroughly brushed out in addition to the hot tank. It looks like there is a plug at the end of the oil gallery that has to get drilled or something. Has anyone done that before? And another set of bearings of course with the machine shop measuring everything in every possible way. Hope to finally resolve this soon! I think the most likely candidate would be the oil line right there that goes to the turbo. Take a look at the diagram in this thread and look for the external tube on the right side (which is the end of the motor closest to the rear bumper): Maybe also the oil gallery plugs that are at othe end of those long galleries. If you clean up the oil and keep a close eye out you should be able to locate the source. A lot easier than the other side of the motor!